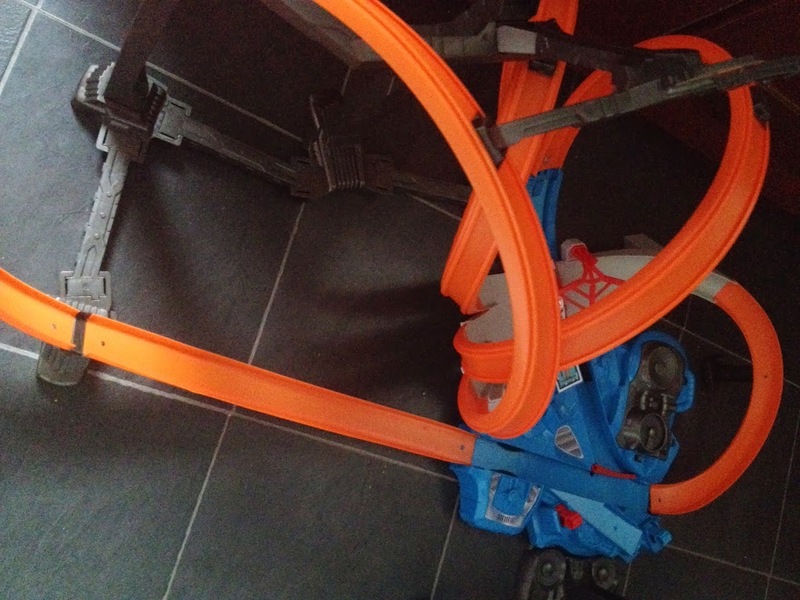 My boys are HUGE Hot Wheels fans and were delighted to try out the Hot Wheels Triple Track Twister Trackset. It took a little bit longer than normal Hot Wheels Tracker to build, but it wasn’t too difficult and after going to buy the 4 D batteries it required we were off. The car spun around so fast, so fast it was hard to keep track. 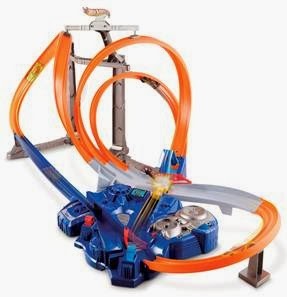 There are little switches on the track that allow the player to move them around all three different tracks with ease. I must say that this is one of Hot Wheels best tracks I’ve come across as the cars rarely came off. It doesn’t take all Hot Wheels cars, they have to be around the same weight as the one that comes with it. We had a lot of Hot Wheels cars, so that was no problem finding the right ones. And it meant both boys could race cars on the track. Once the track is setup, there isn’t a lot to do other than sit back and watch, if you want to that is. However, it’s a lot of fun making the cars change and go over each track. They really go fast, but never come off the track which surprised me. I tried to get some pictures of the car in action, but it was just blurring. You just have to get it for yourself to see how awesome it looks. There is however something extra about this set, you can have the iPad setup to use with it. There is even a stand to hold it and capture the action, yes that’s right this is an Action Capture App and it’s free. My iPad is the first one and wasn’t compatible with it, but iPad 2 and newer and fine. Hopefully Santa is listening and if I’m a good girl, I’ll get one under the tree. We all had loads of fun with the Hot Wheels Triple Track Twister Trackset, something that we can put away and bring out on a rainy afternoon. It’s relatively quick to put up and keeps the boys entertained for quite some time. The batteries haven’t slowed after a lot of play, even though they were the big expensive ones, it looks like they will last a long time. Overall we love this Hot Wheels set and it gets a big thumbs up from us. With an RRP of £44.99 it is a little on the expensive side, but if you have a car fanatic, especially if they love Hot Wheels, then this is a great Christmas gift for them, just don’t forget to include the batteries as it’s useless without them.